Although it was first found in Ohio in June 2011 it has come up in recent news as it is still prevalent. Clermont County has 61 square miles of regulated area where ALB has been spotted and trees that are infested with the insect. This regulated area is an effort to prevent the spread of the insect. 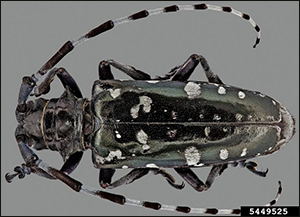 As someone interested in landscaping and horticulture I thought I would take a deeper look at Asian long-horned beetle just in case I coming across it as well as inform others about it in hopes to help eradication efforts. The adults have black bodies with white spots and are 1 to 1.5 inches in length. They antennae’s are long with banding of black and white. The male has longer antennae than the female but the female is slightly bigger. The adult females chew into the bark to lay their grain sized eggs. They hatch after 2 weeks and the larva bores into the tree where it feeds and create tunnels throughout the woody tissue. It continues to feed as it overwinters. The larva then molts into the pupal stage which lasts between 13-24 days where they then develop into adults. The adult beetles chew 3/8th inch diameter round exit holes. They have the ability to fly 400 yards or more to find another tree or mate. One thing that makes it hard to prevent infestation is that it takes 3 to 4 years to show signs of infestation. The infestation eventually leads to tree death. 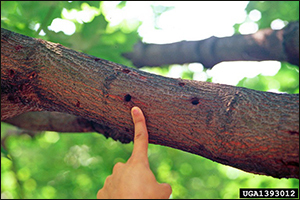 Identification tactics to spot an infested tree are to look for frass at the trunk, bases of branches and look for those exit holes. It is important to be able to know these characteristics when checking trees for infestation especially in the regulated and neighboring areas. It is good to know when Asian long-horned beetle is active. The adults are actively mating and laying eggs during the summer and fall. This information has definitely created some awareness of the invasive species and the destruction it could cause if it continues to spread throughout the state and across North America. I am a Sustainable Plant Systems major specializing in Landscape Design and Management. In my last semester of my undergraduate degree I have found it is important to stay current on topics facing my field of study and future career. I strive to be out in nature as much as possible and I am interested in creating landscapes with a purpose. 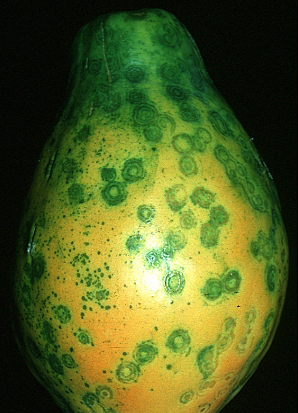 The papaya ringspot virus (PRSV) or Potyvirus is a major disease of papaya (and cucurbits) and is a virus that is found in all the areas of the world where these crops are cultivated. The virus typically infects the papaya in the Caricaceae family and members of the Cucurbitaceae family while also having alternate hosts in the Chenopodiaceae family, specifically Chenopodium amaranticolor and C. quinoa. With there being multiple hosts, there are multiple opportunities for infection, especially if crops are placed nearby one another. The disease is transmitted by means of aphids and is typically non-persistent in the vectors themselves, meaning that the virus does not replicate and eventually becomes unapparent. The disease/virus will, however, persist for a short amount of time in the vector and the spreading occurs in rapid movement and feeding of the vector from an infected plant to an uninfected plant. Papayas originally were mostly grown in Oahu, Hawaii but in the 1950’s, the virus hit those crops and relocation to Puna was necessary. The virus was found again in Hilo in the 1970’s and investigations to develop the GE papaya started in 1985. Hawaii’s largest yield of papaya was 80.5 million pounds in 1984. At the time, Hawaiians probably figured that this would be their all-time high due to the virus being found in nearby regions and did not want to see a decline, but efforts were not quick enough. By 1991, scientists had figured it out and developed a transgenic papaya that was resistant to the virus. This new variety contained a gene from the Papaya Ringspot Virus involved in the coat protein, protecting these papayas against damage from PRSV. When the virus hit Puna in 1992, production levels were at 53 million pounds, about 65% of what it was just 8 years in the past. However, the commercialization of these new GE papayas had not occurred until 1998 and by this time, production levels were at 26 million pounds; essentially cut in half. Japan was and is a major consumer of the Hawaii papaya and with the market in Japan being solely comprised of non-GMO products, they did not accept the new variety until December 2011. This process with Japan and getting them to adopt the new variety indirectly plays a role in how other countries will accept GMO or transgenic products in the future and directly hindered the growth of the papaya market. Even with all of this said, the papaya yield in 2010 was at 30.1 million pounds; 4 million pounds more than the yield 12 years before in 1998. At this rate of repair (4m lbs/12 yrs), it would take about 144 years to get the papaya industry back to 80 million pounds, where it was in 1984. Assuming that the growth would begin to increase exponentially due to increasing farmland used and management methods progressing alongside, the process will go by much faster than previously calculated. What is important is that the yields are increasing and reassuring that the industry and all of its members will continue. Before transferring to Ohio State, my focus in horticulture was in Landscape Design & Management. While I enjoy the designing aspect of landscaping very much and would like to keep expanding in that area, I also really enjoy the care & management aspect of it as well which is why I changed my specialization from Landscape Design to Horticulture. At the same time, I also have an ever-increasing interest in greenhouse operations and the versatility of it all particularly with a few different areas of plant propagation (and its different methods) and also biological controls. Mycotoxins are toxic metabolites that can cause many health effects by getting into our foods and the feed we use for our animals. Fusarium is type of mycotoxin that can be found in our crop fields and in our stored grains and feeds. Fusarium is one of many mycotoxins that have an effect on the health of animals and humans. Fusarium is very capable of causing acute to chronic effects on the body. The effects are generally within the immune system and the intestines. The effects on the immune system include immunostimulatory or immunosuppressive effects on the body depending on certain factors. The Fusarium fungi form as the temperatures get lower and the overall climate tends to stay cooler. The Fusarium fungi can be found in many areas of the United States and is a universal threat to our food and health security. For many animals the effects can vary depending on the animal type and exposure methods. Some effects on animals in diarrhea and can also effect the brain in other animals such as horses. One plant health issue that is local to the area I am from, Northeast Ohio, is Fire Blight. Fire blight is a very common in apples, pears, and anything from the rose family. Fire blight is a bacterium. It is commonly known for entering in the plant through lesions or a surface injury on the plant. Also, fire blights cause cankers in apple trees and pear trees which are sunken in the area by necrosis or death of cells. Fire blight kills the branches and makes them make terminal growth and black tips, but does not cause them to fall off. Hint: that is why it is called fire blight, because it makes the plant look like it was flamed with a torch. Fire blight is easy to be spread and can be done by pruning, wind, dew, birds, etc. It attacks new growth meaning that fertilizing with high nitrogen can create a favorable environment for fire blight to grow and spread. Fire blight if infecting the tree trunk can cause bacterial oozing attracting insects, which can spread the bacteria to other plants. The bacteria called Erwinia amylovora is similar to the bacteria causing strep throat and some unorthodox procedures to prevent apple trees from fire blight is spraying cuts or breaks with strep throat medicine. My family has a small apple orchard, which used to get fire blight, but my father takes measure to prevent fire blight. My father also uses planting beds to prevent humans accidentally causing damage to the tree and regular pruning to prevent too much weight on branches and to produce a plant that has reachable fruit. During the first half of the 20th century, the banana you grabbed on your way out the door was of a very different sort than the banana we are used to today. The Gros Michel or “Big Mike” was regarded as the gold standard. It has been described as a creamier, softer banana that earned the title of the world’s favorite fruit. However, its legacy came to an abrupt halt when a lethal fungus called Fusarium oxysporum came on the scene in the . Fusarium oxysporum or “Fusarium wilt” is a fungus that lives in the soil and attacks at the roots before making its way up the xylem of plants. In a majority of cases, this eventually leads to plant death. Once established in the soil, Fusarum can live for an indefinite period of time. Shockingly, we saw the disease dramatically increase in just ten years. In the wake of this disease, banana producers had to make a change from the highly susceptible Gros Michel to the hardier Cavendish. This required a tremendous amount of time and money as the Cavendish has markedly different growing requirements. This not only had a huge economic toll but, it changed the industry forever. Unfortunatly, while the Cavendish was not susceptible to the same strain of the fungus as the Gros Michel, it is not completely resistant. Other strains have proven to be a challenge to the modern banana. While biosecurity measures and a better understanding of the fungus have given us some tools, we still do not have a way to eradicate the disease. This means that, for now, our Cavendish could very well end up like the dearly beloved Big Mike. I am a fourth year Animal Science student at Ohio State with an interest in infectious diseases and how they spread. Panama disease is such a widespread and readily transmitted disease that I thought it would be interesting to research further. It has reshaped an entire industry in as little as ten years and continues to challenge production. With our population on the rise, food availability is quickly becoming a main concern of anthropologists. An article by the Population Reference Bureau estimates that our population will rise to more than 9 billion people by the year 2050. A recent study titled, “Cereal Cyst Nematodes: A Complex and Destructive Group of Heterodera Species,” by Richard W. Smiley discusses a rising threat to our global food supply. Out of all nematode pests, CCN’s have the greatest impact on the production of small grain cereals. Young plants that have a large infestation of these CCN’s suffer from a stunted growth. Their low leaves become chlorotic, starved for nutrients, and are easily identified as pale green patches in a grain field. Mature plants are also affected, showing knotted roots and a reduced number of tillers. This is seen in figure 1G-J. You can see an example of the young stunted grain crops in figure 1A-C, which is a part of Smiley’s study. It all begins with the nematode entering the root tip, which causes the tip to stop growing and the root to give a knotty look. This leads to stunting and shriveling grain kernels. In individual studies, CCN’s reduced crop yield by 20% in Pakistan, 50% in Turkey, and 90% in Saudi Arabia. Detecting and identifying nematodes is important for applying the proper pest management technique. It is key to monitor their movement, estimate population densities, and correctly identify them. If you were worried about CCN’s in your field, it would be wise to have a soil and plant material sample tested. It is possible for more than one CCN to be found in the same crop, but often the infection is from one variety. So how can CCN damage be treated? Luckily with basic crop rotation schedules, the population is shown to decrease 57-74%. Practicing proper sanitation methods is also advised, as well as using CCN resistant grain varieties. Certain populations of CCN’s can also be managed by planting trap crops and destroying them. Doug Simpson- Agricultural Systems Management Major, Minor in Agribusiness at The Ohio State University. I’m an avid cyclist who races all year. I love horticulture, and spent last summer working at MillCreek Gardens. Will Italian Food Ever Be the Same? Which foods come to mind when thinking of Italian cuisine? Pasta? Cheese? Basil? Grapes? Olives? Fish? Artichokes? I’m not sure about you, but being Italian and growing up in the traditional household, just typing the words make my mouth water, but unfortunately, I may have to be prepared to remove olives and olive oil from my diet. If spread of the bacterial outbreak-thought to have been transferred from plants from Costa Rica-continues north up the eastern peninsula of Italy, trees that are hundreds of years old will be infected and die. This outbreak has been deemed as devastating to the Olive region. Particularly in the Southern part of Salento. Which is where a quarantine will be focused on. There has been a plan implemented for many regions under quarantine however there is no guarantee that will be sufficient. As long as further steps are taken to sterilize and remove infected trees, the chances will be greater for stopping the disease. At most, 35,000 trees could potentially be removed but it doesn’t seem likely anytime in the near future. Although, one farmer stated that the problem is getting noticeably worse and he fears it won’t stop anytime soon. As long as the farmers take their part in disease prevention, it should be easier to contain it. The stress from the disease would explain why olive production has either decreased or stopped, but what could be the cause of this rapid and all-consuming outbreak? Spittle bugs. During their nymph stage, they have a jell type casing that protects their body. They can be found in the grass around infected areas of infected trees. So, these Spittlebugs dine on the leaves that are infected, and as they move from tree to tree, they spread the disease. Therefore, making it even harder to contain the spread. So again, maintenance and vigilance is key to preventing the spread of this disease but also other diseases. Do you research and stay alert to changing or common symptoms for unhealthy plants. So being that the research has linked this disease to its origin of Costa Rica, as well as identified how it spreads and how to best contain it, the prevention should be successful. My name is Taylor Day, I am majoring in Agricultural Communications, and completed my minor in Agribusiness. I love to own and show quarter horses, particularly in reining. Unfortunately, to go to school I had to sell my horses and just pursue my rugby and professional career. I also grew up showing my Doberman Pinscher in 4-H. I wouldn’t mind getting another dog again soon, but currently my two cats aka my lion and tiger, Wheaty and Winston, will do. The Next Irish Potato Famine? When a population’s main food source is wiped out, it can lead to worldwide changes that have lasting ripple effects. One instance that most people know of is the Irish Potato Famine. Late Blight of Potato decimated potato crops in Ireland, causing mass starvation and migration in the mid-1800s. Those that left came to the United States. This event in history greatly influenced the modern German and Irish demographic of the northeast United States. It also indirectly influenced politics. The 35th president, John F. Kenny, is a descendent of a Famine Immigrant. Today, another staple food is at risk: the banana. The fungal pathogen, Mycosphaerella fijensis, causes Black Sigatoka Disease of banana. It causes significant reduction in leaf area. Yield loss can be greater than 50%. It is because of this, there is a possibility that within our lifetime the Cavendish banana we find on grocery store shelf will no longer be an option. The Cavendish is seedless which makes each banana is genetically identical to the one it came from. This lack of genetic diversity has made it impossible for the fruit to outcompete pathogens. Each year 17 million tons of banana are globally exported, almost all of them being of the Cavendish variety. It’s the fourth most valuable crop in the world, following rice, wheat, and milk. Around the world bananas are a main source of nutrition and a main source of an income. If the Cavendish were to go extinct, we currently do not have a replacement for it even though there are hundreds of varieties, parts of the world that survive on banana would face economic, health, and cultural issues. As we’ve seen from the Irish Potato famine when a crop that supports the population both economically and physically fails, then people disperse to areas where they can survive. If countries, like Ecuador, were no longer able to supply the world with a banana, it’s very likely that people around the world may begin to migrate. This would change demographics and present new challenges for everyone. Introducing new people to new cultures can alter history in drastic ways. Even though I have an interest in Plant Pathology, I plan on going to Medical School. I believe that phytopathology will create major ripple effects in the health community in the future. Malnourishment and population shifts caused by major food source extinction are just a couple examples. In an article by Anne Dorrace of the Agronomic Crops Network in association with The Ohio State University, Research is showing that the time to worry about next year’s crops is now. Multiple soy bean pathogens are developing into overwinter disease growth operations. Diaporthe Stem Canker and Cercospora Leaf Blight are only two of the pathogens mentioned throughout the article. Due to warmer winters these diseases that are relevant to Ohio Soy Bean production are starting to develop at the end of crop growth and carry over to next planting season. These diseases are rapidly growing. With warm weather and rain the diseases can be carried from plant to plant by water flow or wind. The growth of these diseases of the foliage of plants is noticeable and can be identified. The first step to healing crops is identifying the problem. Without proper treatment farmers are going to set themselves up for failure before even planting. The Key is to fight the disease as soon as it develops on 2017 crops. After a first does of Phytophthora or any other resistance package, continue regulated use. These diseases are rapidly growing. With warm weather and rain the diseases can be carried from plant to plant by water flow or wind. A few more tips include crop rotation, proper tilling practices, and the use of high quality disease free feed. By planting resistant varieties of soy beans any farmer can decrease crop death from disease. Fungicide applications after planting are helpful but there is no promise of even distribution. Bio: I am a sophomore at The Ohio State University pursuing a degree in Agricultural systems management. I have worked on varies farms participating in different operational task from laboring in pens shoveling manure to driving Class A CDL. Article: Dorrace, Anne. “Agronomic Crops Network.” Should We Add Diaporthe Stem Canker and Cercospora Leaf Blight to Our List of Disease Ratings for Ohio in 2018? | Agronomic Crops Network, Agronomic Crops Network, agcrops.osu.edu/newsletter/corn-newsletter/2017-31/should-we-add-diaporthe-stem-canker-and-cercospora-leaf-blight. If you have ever had a garden, or been to the park during a period of high rain, you have more than likely encountered powdery mildew. Powdery mildew has been a known world-wide disease since 1958, caused by the fungi Erysiphe cichoracearum and more commonly today from Podosphaera xanthii. It appears as a white, powdery fungal growth – seen clearly on the leaf surfaces as well as petioles and stems. Not only is this an issue in your backyard garden, but it wreaks havoc in agricultural production on a world-wide scale. The fungus can be prolific and develop very quickly; as few as 3 days. Affecting cucurbits, or the gourd family, powdery mildew strikes when a hot and humid day comes along and there is sufficient darkness (affecting lower leaves or those under some sort of cover/shade). Powdery mildew can decimate a harvest, leaving improperly ripened fruits or outright killing the plant. Using fungicides may be effective, but preventative measures can help stop it before it starts. When watering your pumpkin, gourd, etc., make sure to not apply water directly to the stem, leaf or fruits. If one applies water directly to the roots from the soil or avoids watering on hot or humid days, powdery mildew can be kept at bay before it begins. McGrath, Margaret Tuttle. “Vegetable Crops Powdery Mildew of Cucurbits.” Cornell University, Plant Pathology and Plant-Microbe Biology Section, Long Island Horticultural Research and Extension Center. Web. 2017.